Three University of East London (UEL) alumni hope a recent award from a major corporation will be a boon to their new startup, which turns rejected fruit and vegetables into smoothies. 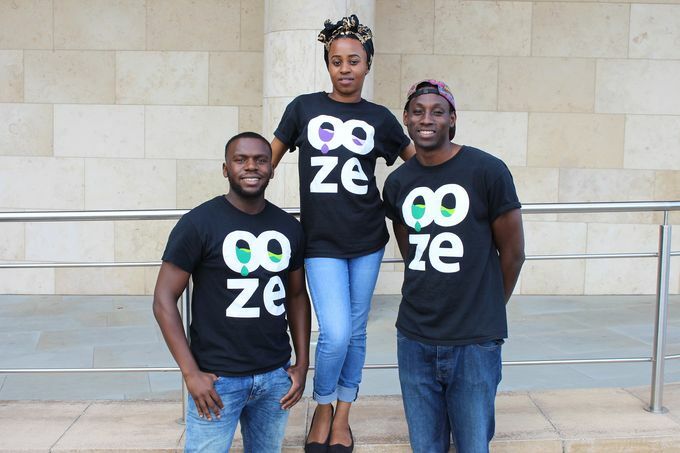 Giuseppe Baidoo, Samson Opayemi, and Valerie Akano are the brains behind ethical company Ooze Drinks, which was recently named a winner of the Shell LiveWIRE Smarter Future Programme. The award, which is given on a monthly basis to different young entrepreneurs, comes with £5,000 cash and access to mentoring with Shell experts. Ooze Drinks caught the attention of judges because of its aim to tackle environmental and social issues by saving fruit and vegetables that are discarded for being misshapen or blemished and turning them into smoothies to help reduce food waste. Giuseppe, Samson and Valerie met while studying for a foundation course in 3D Design at UEL. The idea for Ooze Drinks came to them in 2016 when they entered a competition sponsored by the Royal Society of Arts. Giuseppe said, “For the RSA Student Design Awards we had to think about sustainability and how to tackle food waste. I came up with the idea of recycling fruit and veg because I was thinking about a business idea where I could partner with local food outlets. They discovered that, according to Waste and Resources Action Programme, 90,000 tonnes of food is wasted in the UK, much of it fruit and vegetables. Every tonne of food wasted is responsible for 4.5 tonnes of CO₂. Ooze Drinks aims to turn these rejected fruits and vegetables into ecologically-sound, healthy smoothies, saving as much as 15 tonnes of surplus produce each year and avoiding 65 tonnes of CO₂ being emitted. Throughout 2017 the trio have been working together to get their business idea off the ground. Guiseppe deals with the marketing and branding, Samson focuses on the finance and Valerie is in charge of the production and sourcing the fruits. Ooze Drinks got a boost when it won a Haberdashers award in June. In August, the company received an additional £3,000 in funding from Lloyds Bank, through a school for entrepreneurs which Lloyd runs. Ooze Drinks now has kitchen space in Barking and office space at South Bank University, where Samson is currently a student. Their smoothies are on sale in two retail outlets – the Relish Café in Barking’s Learning Centre and Mac’s café in Tooting. By the end of the month they hope to sell their drinks online. Giuseppe said they still have a long way to go, however. Ooze Drinks could potentially receive another big boost when, as winners of the Shell prize, they are considered for the annual £25,000 Shell LiveWIRE Young Entrepreneur of the Year Award.